With 70 million users worldwide, Pinterest is the fastest growing social media channel for online content sharing (Share This), making it a must-have tool in any business’ social media strategy. Since Pinterest is image based, it’s the platform of choice for showcasing brand personality, as well as demonstrating your products and services. The likes of Coca-Cola, Lotus F1 Team and IKEA UK are making the most of Pinterest to expose their brand virtues. For example, Coca-Cola incorporated their ‘sharing’ message into their board titles and pin images, reinforcing that core value. Lotus F1 posts unique images of their team, keeping followers entertained and engaged with the brand. Traffic: According to Compete Data Insights Pinterest accumulated 38 million unique visitors in March 2014 alone. By the end 2013 they were driving more referral traffic to publishers than Twitter, YouTube, LinkedIn and Google+ combined, coming only second to Facebook (Shareaholic). Links: The ‘Pin It’ button can be included on your page, so that every pin includes a link back to your original content, meaning that when pinners encounter your pins your website is just one mouse click away. Leads: Since Pinterest generates more sales leads than the other top 5 social media sites, you can help generate leads by creating a Pinterest account and engaging consumers early on in the buying cycle. Try creating a board dedicated to your products/services or offers. When creating your Pinterest account, you need to think carefully about how the look and feel will relate to your brand, and the role it will play for the business. Every social media channel has a different audience and its own advantages, and therefore a different role and responsibility in representing your brand. · Ensure your logo and all uploaded images are of high quality and represent your brand. · In ‘Settings’, ensure you’re web searchable, enabling search engines to list your Pinterest account when someone searches for related content. · Connect your Facebook, Twitter and Google+ accounts to help users find you and generate cross-channel promotion. · Add validity to your own account by following relevant users and certified industry Pinterest accounts. It’s important to make your board names relevant and obvious enough to find in searches e.g. ‘The Games’ vs ‘The Olympic Games 2012’ – people are more likely to search for the latter. · Create campaign and event boards to show off specific activities. · Make the best board on a specific topic to attract pinners who are passionate about that topic. · Ensure your most important posts are at the top so they can be seen at a glance, particularly on smaller mobile devices. · Add a short description of the image you intend to pin. · Use hashtags in the pin description to help with Pinterest searches. · Mention other related brands in your pin description using ‘@’ to encourage them to follow or promote you. · Start engaging with and following the pins of people who you think would want to follow you back. If you comment and like their pins, chances are they might follow you. · You can invite other users to co-contribute to your boards thereby increasing your shared content and engagement. · Hold a Pinterest contest, where you get users to create a board demonstrating what they love about your brand. It’s not only great promotion but also engages your audience. It almost goes without saying, pinning more images will increase your opportunity for more followers. But if you regularly share pins or ‘re-pin’, this activity will also help to bring more visitors to your page. The key to success is finding and pinning images that people will enjoy and want to share. Consequently, Pinterest will recommend you more often to people who pin the same image. One way to increase your Pinterest presence is to promote your Pinterest page through other channels. For instance by including the Pinterest Profile Widget, as well as embedding specific Pinterest boards, on your site you can attract followers and add relevance to a page. Social media is also another great way to drive people to your Pinterest site, so ensure you are mentioning your page on other social channels and make sure to add to your website the Pinterest ‘Follow’ and ‘Share’ buttons alongside your Facebook and Twitter icons on your website. It may go without saying, but bears repeating, knowing your audience is key. What does your audience use Pinterest for? For instance, do they use Pinterest for shopping or finding inspiration? Once you know this about your audience, ensure you put a spin on your brand that fits with your audience, especially if you don’t have a Pinterest friendly brand. Think outside the box and engage your followers by sharing pictures of what inspires your brand and culture. Lowe’s Hardware is a great example of this. They found that 68.2% of all Pinterest users are women who generally like to shop and enjoy design and crafts (Social Media Examiner). Therefore, instead of posting pictures of drills and hammers, Lowe’s Hardware used their Pinterest page to showcase style inspiration for the home, lifestyle ideas and gift ideas, providing something aspirational which their services could help to achieve. 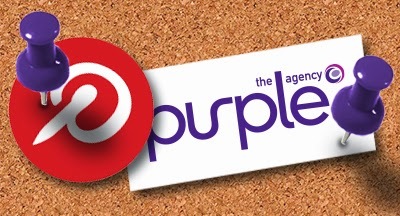 At the Purple Agency we use Pinterest to show what inspires us, share motivational quotes and highlight all things to do with the colour Purple. Check out our Pinterest page here. Pinterest recently added ‘article pinning’ which allows you to save or share an article directly from a website. It has also just introduced ‘promoted pins’ which let users pay for their pins to be publicised at the top of the page. Whilst still in its early stages, this new addition offers even more opportunities to engage your audience and draw them to your site. Together with the original features, as a social media channel, Pinterest provides a more entertaining and colourful way of spreading your brand around the world. Helen joined Purple in 2012 straight from Southampton Solent University coming on board as a Junior Digital Project Manager, since then she has moved into the Client Services sector as an Account Executive. Day to day Helen works on a mixture of accounts, predominantly sporting ones, and is a regular competitor in the Purple bake offs as well as an avid pinner on Pinterest. Legals Copyright © 2015 Adare International Ltd. All rights reserved. Legals Copyright © 2012 Adare International Ltd. All rights reserved. Powered by Blogger.